It is rare for a small, essentially community-based theater like Sierra Madre Playhouse to receive a chance for the Los Angeles premiere of a high profile play, but it has happened. 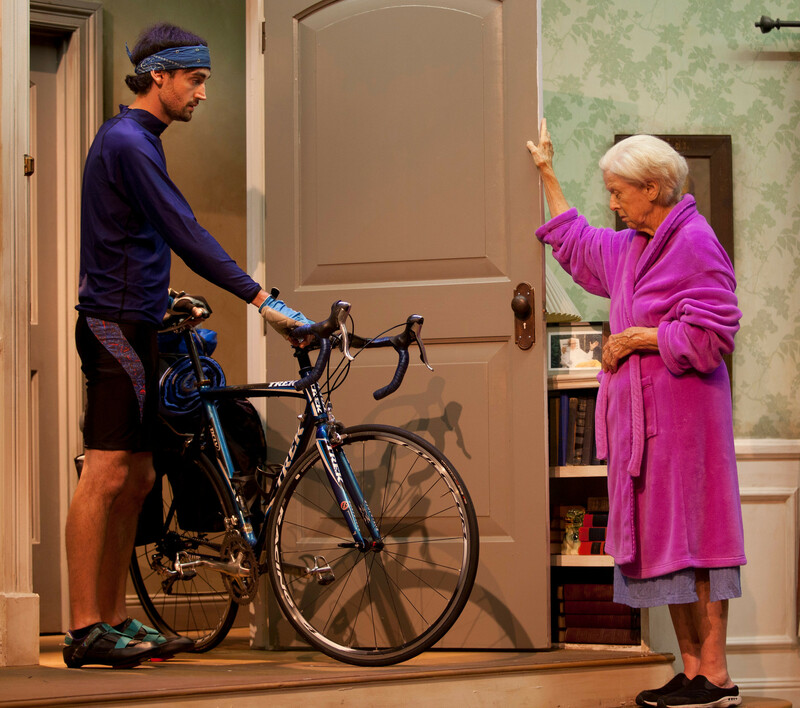 Amy Herzog’s Pulitzer-nominated “4,000 Miles” has arrived at the small theater to much fanfare. The play, which looks at the interaction between an idealistic, somewhat immature young man who has bicycled across the country and the leftist grandmother he ends up staying with in New York City, offers a few statements on growth, on city vs small town activism, and on what the maturation process really means. The tale starts with the arrival of Leo at the New York apartment in the middle of the night. Thrown by the rejection felt from the girlfriend he’d hoped to connect with (recently landed in NYC herself), he ends up staying with Vera, the wife of his late grandfather. As she teaches him focus and responsibility, he opens up about the horror of his cross-country bike journey, and gradually they both come to understand one another. It’s not that he will stay in the city, but perhaps now there is a link which will survive the distances. Christian Prentice makes a great Leo – handsome if rough-hewn, overflowing with energy and opinion, slow to learn to listen. He makes a fine foil for Mimi Cozzens, as Vera, a woman used to being alone but gradually and increasingly glad of the comparatively non-standard company. Their best moment comes in a scene in which Leo introduces Vera to a bong, producing genuine laughter onstage and off. Alexandra Wright makes fine work of Leo’s erstwhile girlfriend, displaying all the confident maturity and practicality he seems at first to be incapable of. In a brief, but very funny scene, Susane Lee has a great time with the Chinese-American girl Leo picks up one night, who cannot get over the fact Vera has “The Little Red Book of Chairman Mao” on display in her living room. Director Christian Lebano has taken this rather talky play and given it as much legs as one can. John Vertrees’ beautiful set – complete with a background scene which got – and deserved – its own applause, makes a very realistic apartment for these folks to inhabit, though in some ways it becomes claustrophobic. But then, that may also be a point. If there is any issue, it comes from Cozzens’ portrayal. Vera is to be occasionally forgetful, but Cozzens makes her, if anything, more so. Indeed, the hemming and hawing happens so often it begins to look less like the script and more like an actress struggling for lines. This is too bad, as the best moments are rich and filled with a special kind of wisdom and fatalism which comes with intelligent aging. Arguably, in many circumstances the best way to teach children something about the past is to show them. For that reason, various groups at one time or another have created theatrical experiences intended as living educational tools. These can either be taken to schools or – if it is possible – students can be brought to the theater to appreciate two things at once: live theatrical performance, and a greater understanding of whatever historical period, etc., the show is trying to make come alive. One of the most recent of these is “Battledrum,” by Doug Cooney and Lee Ahlin, the new, original musical running at the Sierra Madre Playhouse. Its main purpose is to educate, and in that capacity it has booked an impressive number of daytime performances for classrooms-full of students. The usual lobby posters have been replaced with an extensive historical display of photos and commentary. Even samples of period clothing appear at the end of the hall. Opening it to the general public for evening performances appears to be only a sideline to the show’s main purpose. The story revolves around an under-discussed aspect of warfare prior to the 20th century: the role of the drummer boy. Drums were used by officers to communicate across long distances, and thus the boys playing them were often seen by the enemy as targets in the same way the radio man would have been in the 20th century. 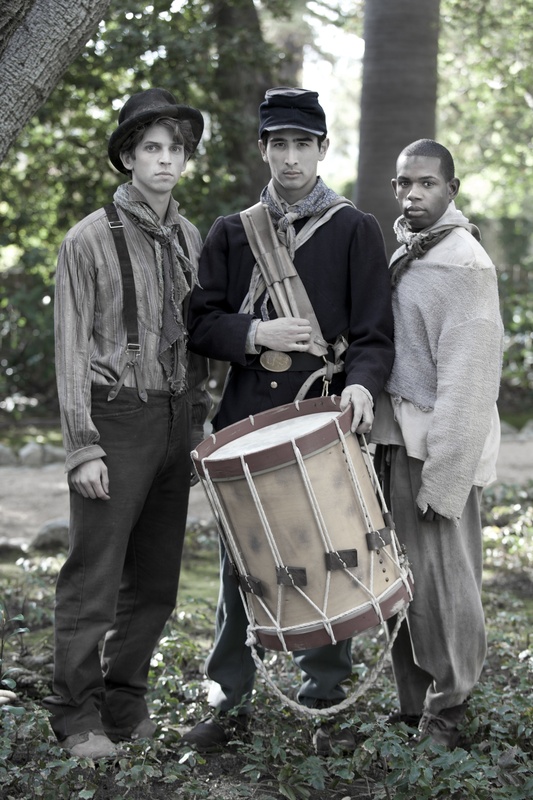 In this case, the topic is the American Civil War, and we follow three disparate boys who end up as drummers for the same northern company. One has been with the army for some time, moving up to the primary drummer as those above him have been picked off, and is proud of his status as first drummer. One is a boy the company picks off after his farm is destroyed by those troops. He has nowhere else to go, and likes to drum, but his loyalties are complex. The third is an escaped slave absorbed – somewhat problematically – by this company and befriended by the two other boys. As a play, “Battledrum” is a good introduction to the tensions and risks of war for younger children. The characters are empathetic, and the music – though not particularly memorable – is sung with gusto and commitment. There is a sense of military hierarchy, and the pathos of an absent mother and of a young Southern woman in shock. And there is enough drumming to keep the kids rather envious. It is also short – less than an hour and a half, without an intermission, so the wiggles will be comparatively few. On the adult evenings, at least, members of the local Civil War Roundtable, who study and portray folks from that period, were on hand to give a local angle to that rather distant war. This may be an attempt to add a certain sophistication to what is essentially a live “afterschool special”. The show has been double-cast, because of all the daytime performances. The night I saw it, Chris Clowers brought a gee-whiz quality to young Rufus, who escapes his burning barn to end up in the friendly hands of his enemy. Patrick Dillon Curry gave a sense of youthful authority to the drummer boy somewhat resentful of Rufus’ presence as his potential replacement. Damone Williams created a very likable, earnestly freedom-seeking young escaped slave ready for the protection and adventure of his new military position. Will Cespedes provided – and provides for all performances – an anchor of command as the friendly but authoritative company captain. The cast was rounded out by other strong players, with smaller or multiple parts, including Kaitlin Cournelle, Mark Ostrander and Tara Bopp. Director Christian Lebano has put his all into making this play work, and it does give a sense of authenticity (though perhaps the treatment of the slave is a bit on the warm and fuzzy side for even northerners of the era), until the very end, when suddenly all the performers are drummers, doing a really cool routine no captain would ever be a part of. It’s as if nobody really knew how to end it on a historically accurate note. In any case, the costumes by Elizabeth Nankin are excellent, the setting – though spare – gives an open impression on the tiny SMP stage, and the vitality and pacing of the piece keeps the audience connected. It’s a great way to be introduced, as a child, to what the Civil War was like, even if it is rather the “kinder, gentler” version of events. In any case, it’s great for grade school kids. There is a memorable moment in the film “Oh God” when the deity, played by George Burns, shakes his head over a wealthy television preacher: “If what he wants is to make money, let him sell Earth Shoes.” The struggle between faith and mammon which comes with huge religious enterprises and megachurches is one worthy of examination. And that’s what David Rambo’s “God’s Man in Texas” wrestles with: the positive, even saving energy such a community can provide, yet the potential for hubris, insulation and extravagance. Now at the Sierra Madre Playhouse, a polished, clean-lined production gives the audience food for thought. Dr. Philip J. Gottschall, now in his 80s, has built an entire community around his enormous conservative church. There is a television broadcast, school from kindergarten to college, recreational activities, annual parades – a community at once welcoming and insular. His wife’s Bible study group contains the political movers and shakers of the Houston area. The take in the collection plate is in the thousands every service. But Dr. Gottschall is in his 80s, and the board which runs the church’s enterprises is looking for an eventual replacement. After various try-outs, they seem to have picked Dr. Jeremiah Mears. Thus begins a struggle for the soul of this huge institution between the man who see himself in every part of the thing, to the man who wants to make it his own. Through it all, they are each assisted and given certain reality checks by Hugo, a devoted member of the church’s 12-step programs who provides the practical voice of the common man. Ted Heyck gives Dr. Gottschall the right mixture of pronouncement, paranoia and earthly pride, as a man who cannot admit to his own aging, or that anyone else could really be as right as he is. Christian Lebano’s particular timbre of calm as Dr. Mears makes a fine balance against the intensity of Heyck’s character. Thoughtful, devoted, but increasingly frustrated, his demeanor as well as his lines underscore the differences in the approach of the two men to the same topic. Paul Perri is a hoot as Hugo, at once fragile and practical, silly and dedicated. Director Nancy Youngblut keeps this very talky, often amusing piece visual, utilizing the tiny SMP stage effectively and creating a sense of a huge church out of nothing but a pulpit and the look in her characters’ eyes. This is aided by the particularly fine (if a tad wobbly) set by D. Martyn Bookwalter, which creates specific spaces with artful minimalism. Obviously, this play leans a lot on sermons and talk of religion. Yet, the interest comes from the balance of those religious sentiments with individuals’ actions – and the purposes behind the words, when spoken. Even audience members who do not echo the passions of those onstage will find “God’s Man in Texas” an interesting, if not overly deep study of character and ethics. Once seen mostly as a sweet, sometimes fascinating character study, Alfred Uhry’s “Driving Miss Daisy” has gradually become a subject of controversy, in much the way that “The Help” has. The genre, which tends to view the segregated south through the lens of the humanity created by personal interaction between the traditional white elite and their patient African-American domestics, has kind of had its day. That is, if one still plays those parts with that tendency to pigeonhole its participants. 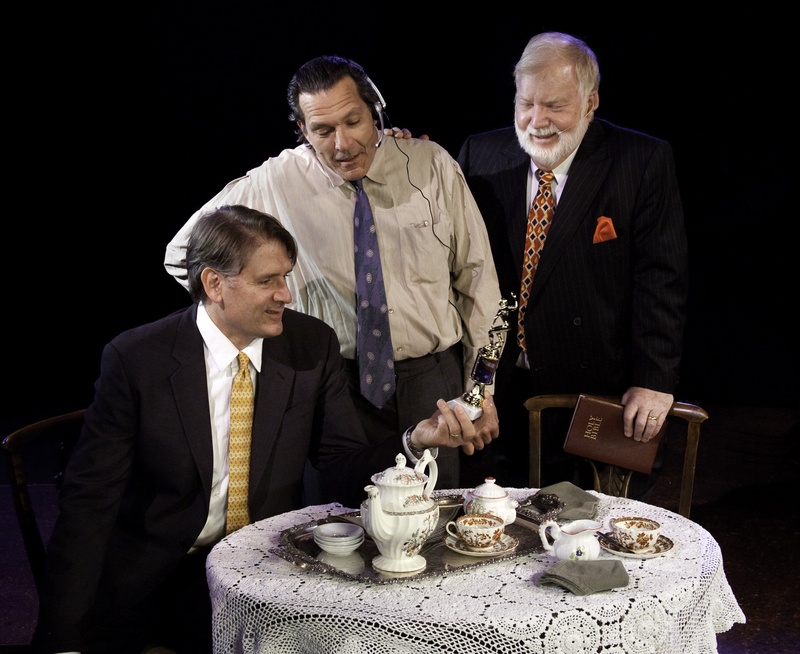 What seems to set the new rendition of Uhry’s play at the Sierra Madre Playhouse apart from some others is the essential maturity of all the characters. This Daisy is terrified of being alone and covering it with bravado. This Hoke is a shy but manly figure whose deference is more to infirmity than color. This Boolie genuinely loves his mother, “gets” Hoke, and is personally cheered by the relationship his mother has with her confidante. Director Christian Lebano, realizing this may not be an easy show for some, has even included in the program a set of questions for people to use as discussion starters after the play is done. It’s an acknowledgement of both the touching nature, and the baggage, of this play. 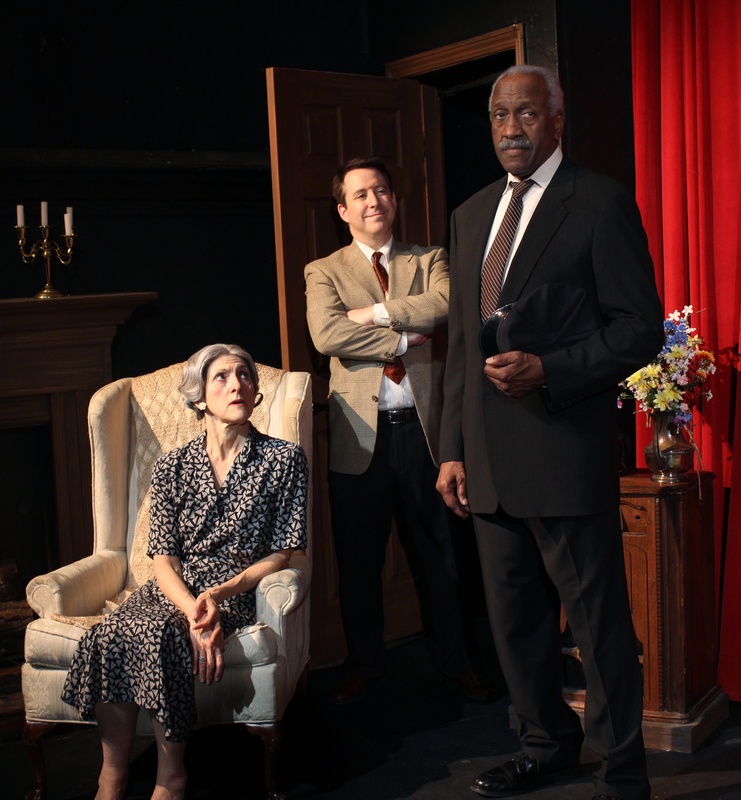 Still, “Driving Miss Daisy” remains, at heart, a play about distinct and interesting individuals. Impressive actors can make this piece what they will, and this is most certainly the case here. Mary Lou Rosato ages with great physical accuracy as Miss Daisy, moving as an aged woman would while giving a refreshing balance of crochety-ness, underlying care, and subliminal fear to the part. Even the very end – a tough element of this play which is rarely done with subtlety – has a startling truth to it, which makes it particularly human. Willie C. Carpenter gives Hoke more than just the usual dignity, but a kind of presence which lets him look Daisy’s son Boolie in the eye. These are not equals, perhaps, but these are both men who understand that the differences in their social standing are societal more than personal. Carpenter infuses Hoke with that manliness, and – once again – accurate view of the aging process, which make him Daisy’s rock as much as Daisy’s driver. Perhaps most surprising is Brad Reed’s Boolie. Boolie is usually played as a classic “trying-to-fit-in Jewish Good Ol’ Boy.” Reed’s new spin on the part doesn’t humor or patronize his mother, but rather walks the delicate balance between his love of and identification with her and the realities of his business life in the Atlanta of his day. He gets her. He gets Hoke. He even sometimes seems a tiny bit envious of their ability to live honestly themselves. This portrait ties the whole piece together in interesting ways: a new view, if you will, of the entire proceeding. Kudos also go to the show’s production values. Gary Wissman’s blissfully simple set keeps the pace of the play (which is performed without intermission) moving right along. Kristen Kopp’s costumes are accurate right down to Daisy’s shoes – impressive for such a small theater. Simple polish seems to be the hallmark of the whole production. So, take a look at this “Driving Miss Daisy.” Though it remains admittedly controversial, a chance for a new window into such a piece is always useful. And that’s what this production offers: a new window, a new slant on something which has often gotten either too cosy or too disquietingly stereotypical. Whether you agree or disagree with the play or the interpretation, the discussion to follow can be a fine exercise all on its own.